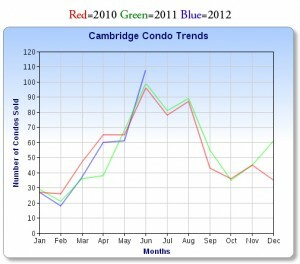 Cambridge Summary: Lack of inventory continues to tighten the market down 38% compared to June last year. ~ Condo listing $ volume remains down by comparison by 28% from 141 million to 101 million in market value. 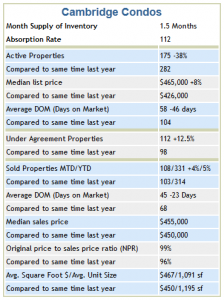 ~ The median list price is up by 8% or $39K with days on market dropping to an average of less than 2 months before going off market. ~ Condos that went under agreement went up by 12.5%. 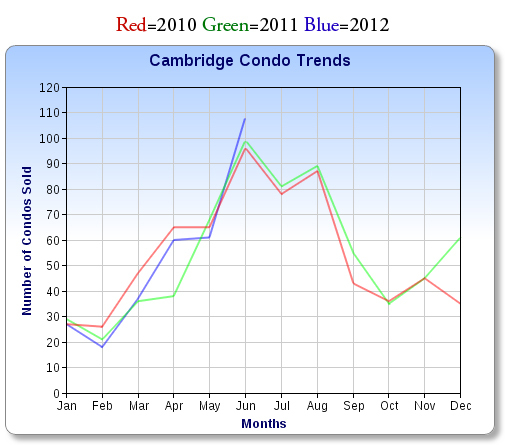 Cambridge condo sales, month to date, are up 4% with year to date number of sold condos up by 5%. 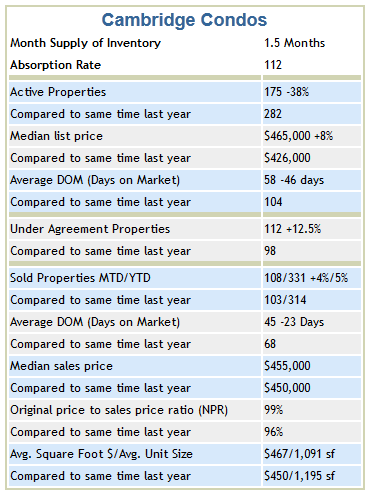 Sold $ volume YTD increased by 2% from $161 million in 2011 to $164 million this year. The median sale price improved by $5,000 with the ratio of sale price to original price at 99% due to multiple offer bidding and reduced time on market. ~ The average square foot price for April was $469 per square foot with the average living area at 1,088 square feet.